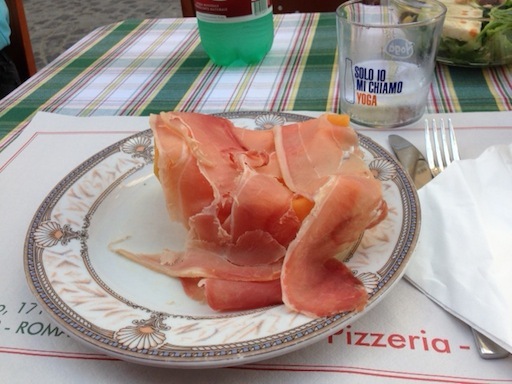 Over the past six weeks in Italy, I have consumed at least my body weight in the following; tomatoes, cantaloupe, mozzarella cheese and prosciutto. My two main dishes have been prosciutto y melon and Caprese salad. 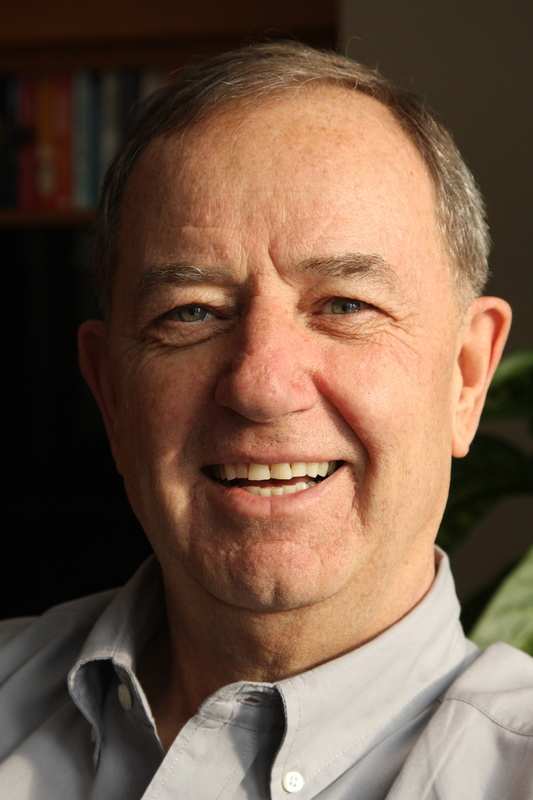 They fed my body as well as my soul – as well as being incredibly tasty. In each region I have managed to supplement my list of favorites with endless variations of regional specialties and the most superb pastas, all done al dente to perfection, and all smothered in sauces like Mama used to make – that is if your mama was Italian. I would hate to think of the actual weight of pasta I’ve consumed in relation to anything measurable – probably enough to outweigh Skippy – but he’s a small auto – so maybe more. But there I go being North American – in Italy it is NOT about quantity it is about quality; quality is what counts. In simple dishes, it is ALL about the ingredients. 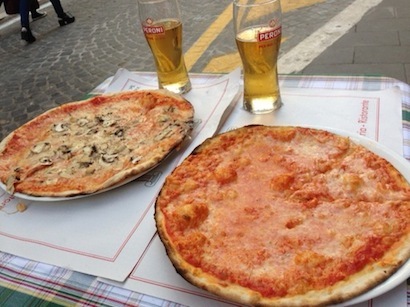 Rome has introduced me to Roman thin crust pizza, and, in a discovery rivaling Columbus finding a few rocks where they shouldn’t be, I discovered little balls of deep fried coated abruzzo rice called suppli. They are street food like no other. 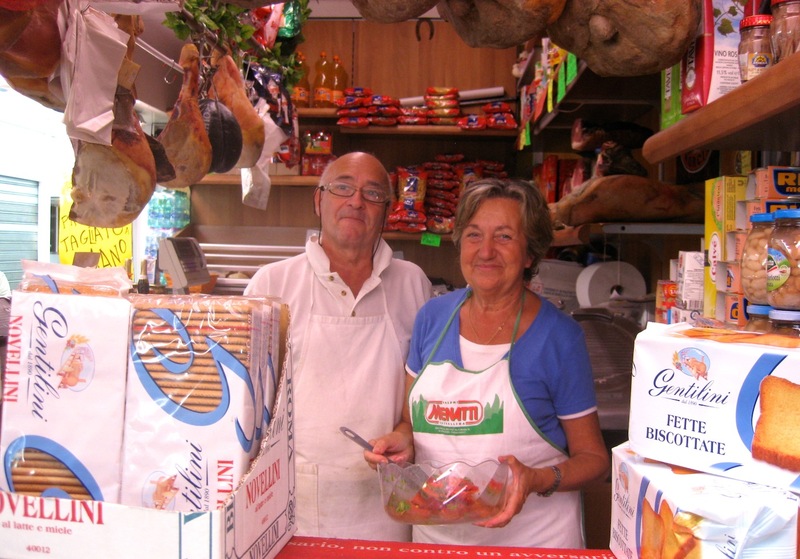 There are not two but three religious themes in the lives of most Italians; the holy Roman Catholic Church, the church of club football and the daily worship of food, glorious food. 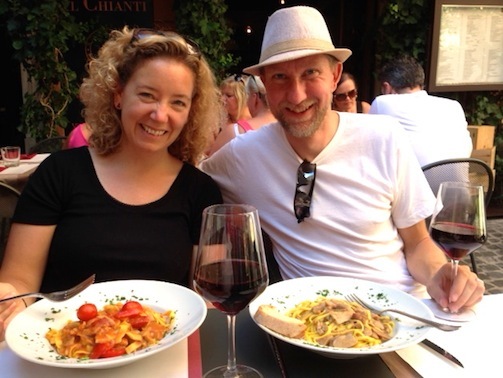 We took a full day to worship food in a few blocks of a neighborhood called Testaccio, a short walk from our base in Trastevere. It is so small it does not register on our tourist maps as a neighborhood. Dominico, our guide for the day, describes it as a working class, blue-collar kinda place. For thousands of years, food for Rome and environs was brought up the Tiber and unloaded here, a place of warehouses, slaughterhouses and other food distribution facilities, It is a place where food has been taken very seriously for centuries – one could say food is in their blood. We are led from one long-held family-owned enterprise to another, tasting our way through the specialties of the house, a pastry usually consumed at breakfast, a small intense chunk of parmagiano reggiano, a slice of salami al barolo and a thin slice of the best prosciutto I have tasted so far (prosciutto di san daniele), a piece of pizza Margherita fresh and warm from the oven. Are we full yet? Nope, we’ve just started, hardly into the first hour of a four-hour tour. We visit the Testaccio market, ancient in origins but recently refurbished with modern stalls for long established businesses. 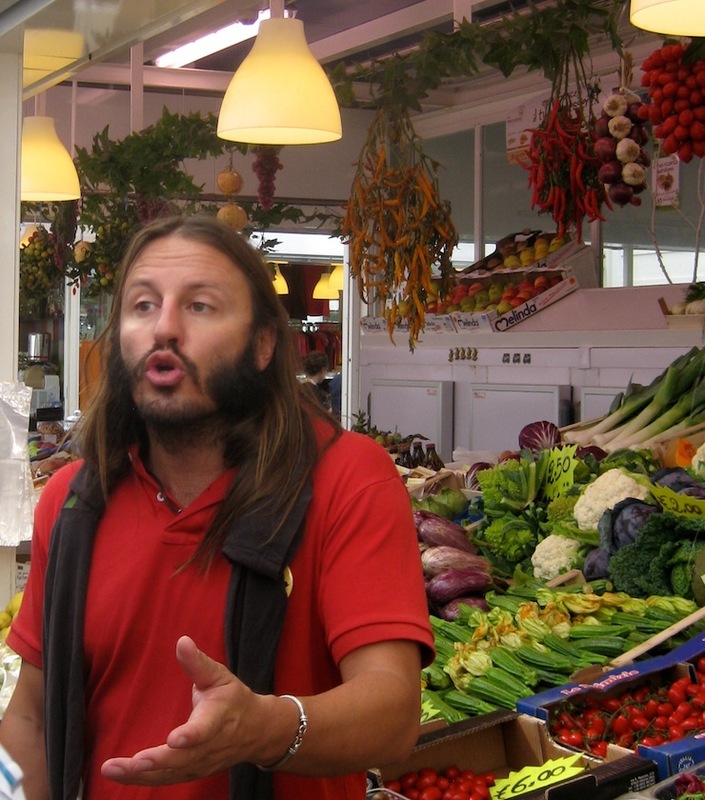 Dominico tells us this market is where people come DAILY to shop for the daily meal. After tasting the fresh mozarella, the juiciest tomatoes mixed with spicy arugula and garlic, we agree. there is something to be said for buying fresh. And as for what is the best use of tomatoes, mozarella and basil/arugula – Bruschetta or Caprese – I’m ambidextrous. Monte Testaccio, the areas namesake, is literally a mountain of broken terra cotta roof tiles piled up over the years. This artificial mountain has been turned into a cave for storing wine, and now a delightful back wall for restaurants; we sample the local wines along with three different pastas; one, the cacio e pepe, has a delightful peppery taste. Finally, just as I think I have reached my limit we discover my favorite, the deep fried rice balls, at a small hole-in-the-wall called Trapizzino, another example of passionate cooks who are re-inventing the sublime traditions of Italian cooking. We complete our tour at the aptly named Tutti Frutti with gelato topped with whipped cream from a mixmaster that looks like it was dug up near the Colosseum. Decadently delightful. 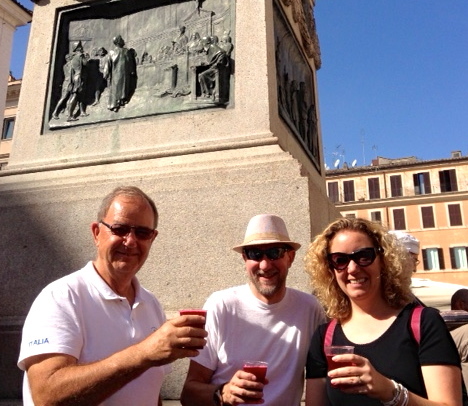 We visit the famous Campo di Fiori open air market – fresh Pomegranate juice squeezed on a machine that was invented about the time the market started – the middle ages. 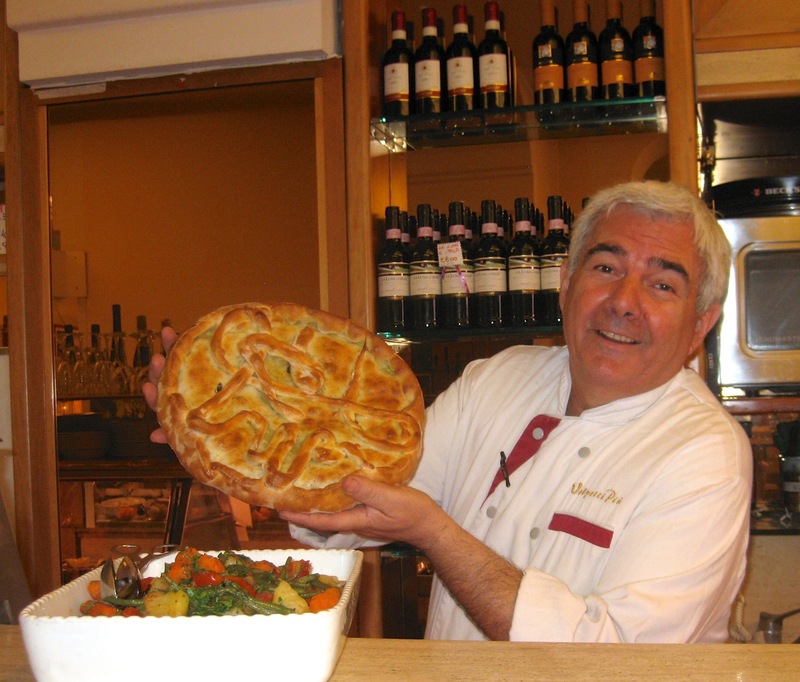 Tonight, our last night in Rome is saved for a return trip to Testaccio to a place that is so famous amongst locals it doesn’t need a name – Dominico says just ask for the Lasgana place. I cannot wait. 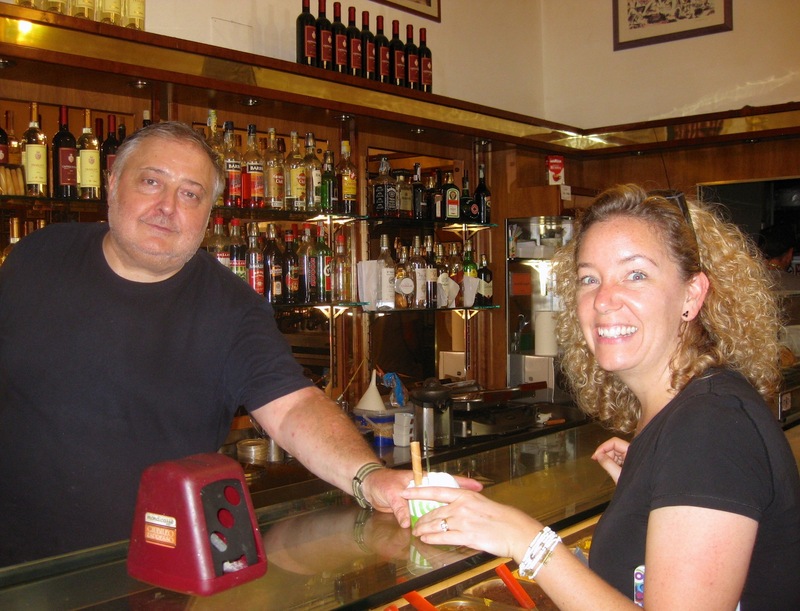 This entry was posted in Uncategorized and tagged campo di fiori, caprese salad, fitness over 60, middle aged fitness, midlife adventures, Off the Couch and Out the Door, prosciutto y melon. Trapizzino, Rome, Testaccio, Trastevere, writing and publishing. Bookmark the permalink. 1 Response to Food, Glorious Food. Yummy. I’m now in the Bahamas, with the kids. Final stop on the tour home to Ron next Friday. The beaches here make up for the food. Good but oh soooo expensive!!! When are your travels over?